So I have come to the end of my Protective Style and Castor Oil Challenge and have to admit I am a little sad. Figured B&W pictures would show “sadness” but to be honest I just love the look of B&W photos! Anyways, I will have a separate overview of the challenge as a whole, along with a video shortly but I just wanted to share how my last week went in this post. How did my last week go? Not to sound like a broken record but it went well. I did two protective styles over six days and of course also massaged my Castor Oil Mix on my scalp, hairline and ends four times in the week. My two styles were as always super simple. 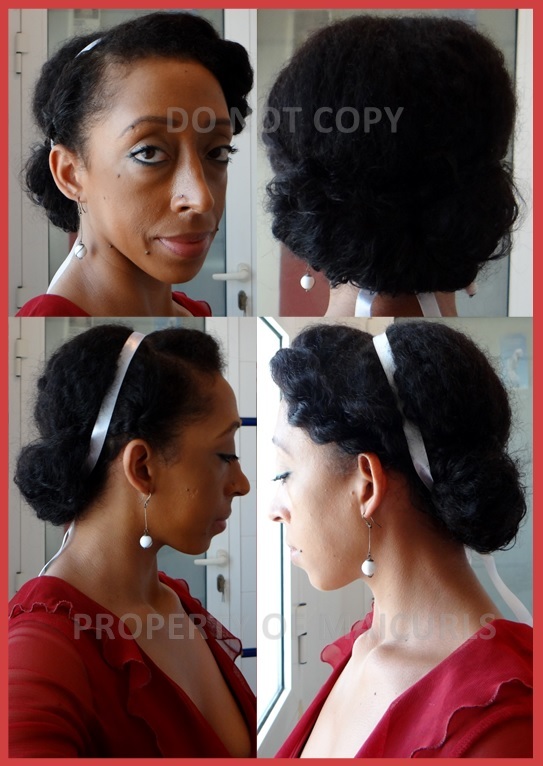 For the first three days I did a really quick & loose pinned back up-do using only bobby pins. On the last three days I did a roll and tuck with 3 two-strand twists & accessorized the style with my DIY Floral hairband. I did my wash day routine on Sunday, moisturized and sealed before twisting my hair at night. 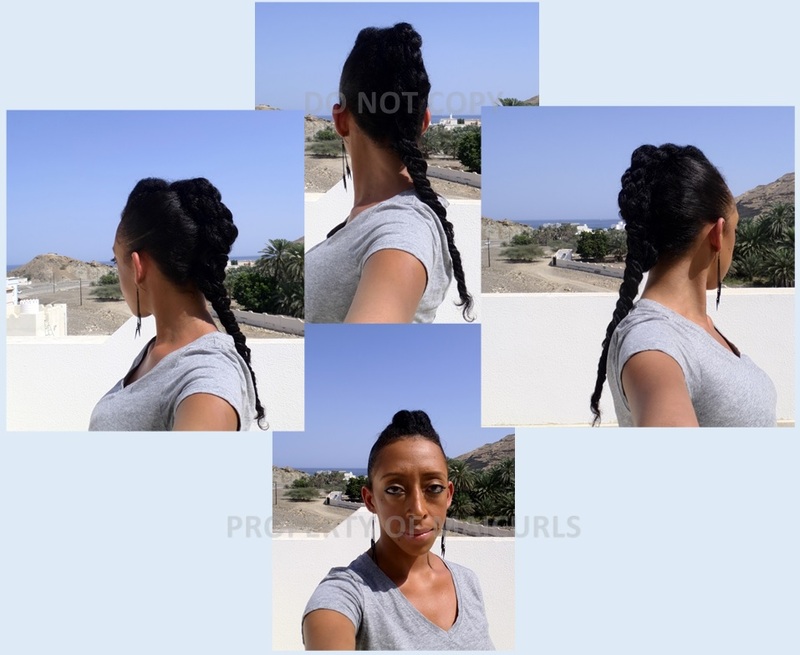 Day 1 – After taking down the twists in the morning I massaged my Castor Oil Mix on my scalp, hairline, ends and did one of the simplest styles since starting the challenge for the next 3 days. 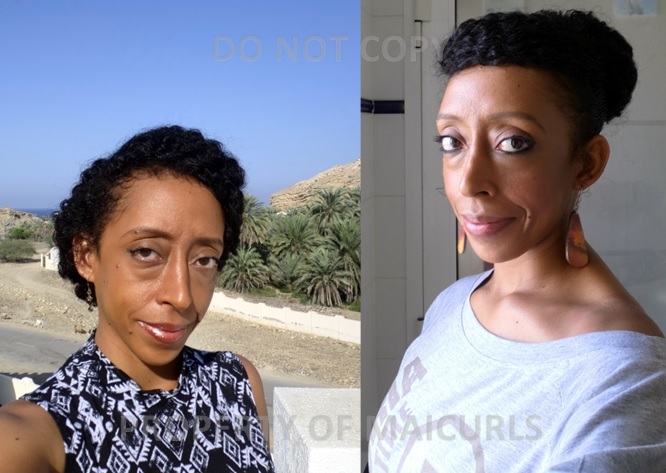 Day 3 – I reapplied the Castor Oil mix to my scalp, hairline and ends at night. I left two sections on the sides and one at the front to make two-strand twists. The rest of my hair was pulled back and rolled up. I pinned my hair at the top instead of under (by my neck). 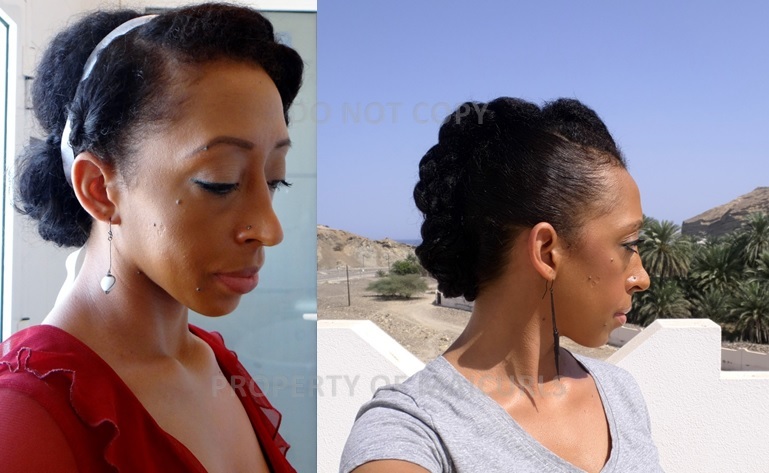 I took the twists to the back to give my hair a little texture and pinned the twist at the top as well. Day 5 – At night I took my hair down, massaged my scalp, hairline and ends with the Castor Oil Mix and pineappled to sleep. Day 6 – Redid the style and at night I repeated the night method of day 5. As mentioned, I used the castor blend 4 times during the week. My hair felt a little limp by day 7 because I might have used a little too much whipped butter after re-moisturizing but I was still left with smooth, moisturized, shiny and soft hair. So that was my first attempt at 6 weeks of protective styling and castor oil massages. Like I mentioned I will have a recap post of my final results along with a video explaining my experiences and plans but I can tell you now I enjoyed the whole challenge and it shall be repeated! This entry was posted in Accessorizing a protective style, Castor Oil, Castor Oil Challenge, Cocoa Butter, DIY Creamy Leave-In, DIY Whipped Butter, Hair Care, Hair Challenge, Natural Butters for Hair, Organic Butters for Hair, Organic Unrefined Cocoa Butter, Organic Unrefined Mango Butter, Organic Unrefined Shea Butter, Protective Style, Protective Style Challenge, Random Up-Do's, Whipped Butter, Whipped Butter for Hair and tagged castor oil, Castor Oil Challenge, Castor oil for hair growth, castor oil for healthy hair, castor oil for healthy scalp, castor oil for natural hair, DIY Creamy Leave-In Conditioner, DIY Whipped Butter, Napturally Curly, Napturally Curly Forum, Protecting ends with Up-do's, protecting natural hair, Protective Style, Protective Style Challenge, Protective Styles, Protective Up-do's, Shea Butter, tuck and pin, Tuck and pin updo, updos, Whipped Cocoa Shea Mango Butter, Whipped Hair Butter on November 5, 2014 by Maicurls. First I want to apologize for being late with this post I once again got caught up with work and personal stuff but I am here with an update! There is just one week left of my Protective Style and Castor Oil challenge and I can proudly say that I am glad I did it and look forward to incorporating more protective styles into my routine from now on. How did my fifth week go? Similar to the previous weeks, everything followed together really well. I had my hair tucked away for 6 days of the week, used my Castor Oil Mix 4 times and then washed my hair. I noticed that I tend to do a really quick style at the start of the week and then try to do a little more for the second part (probably because I subconsciously want a little more “oomph” on the weekend). I will admit that when I took my twists down on the first day I really really wanted to rock a twist-out…the definition was AMAZING but I was strong. The first style I did was a SUPER quick and simple tuck and pin and then finished with a big puff bun with a deep side-bang (I really liked this one)! I did my wash day routine on Sunday which included a new and improved Protein Deep Condition (DC) followed by my Moisturizing DC. (The Protein DC involved egg yolks, hibiscus tea, gelatin, coffee infused oil and a little conditioner. I will eventually have a write-up and how to video). I moisturized my hair with my creamy leave-in conditioner, lightly sealed with a tiny bit of oil and then added some of my whipped butter before putting my hair into 12 twists. Day 1 – After taking the twists down I massaged my Castor Oil Mix on my scalp, hairline, ends and randomly pinned my hair back. There was no real strategy to the method I lightly rolled my hair at the front, tucked it and used bobby pins to hold it in place. For the hair at the back I loosely rolled my hair under and then pinned it (repeating this every morning gave me slight variations in the look). Day 3 – I reapplied my Castor Oil mix to my scalp, hairline and ends. Day 4 – I moisturized my hair with my DIY Creamy Leave-In Conditioner and sealed with Almond Oil. I then put my hair into a big puff bun with a side-bang. Day 5 – I took down my hair at night, massaged my scalp, hairline and ends with my Castor Oil Mix then pineappled for the night. 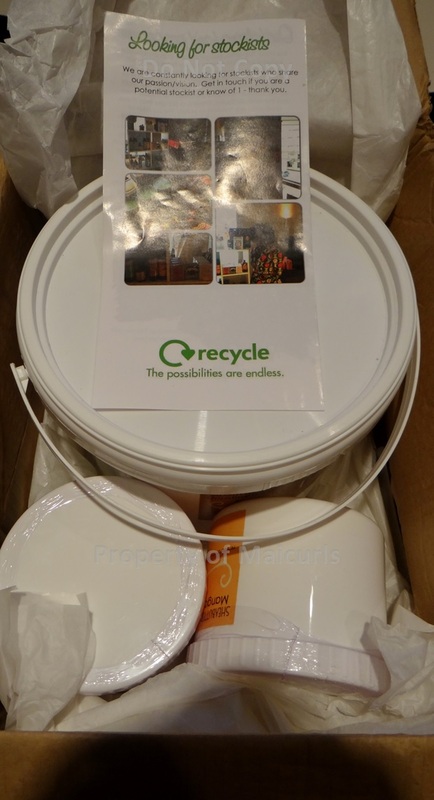 Day 6 – I repeated what I did the night before. Day 7 – Wash day routine and then got my hair ready for the final week. I still am amazed at the fact that although I have fine hair, I can still get away with using a thick oil like castor without ending up with greasy limp hair. Since I thoroughly enjoyed incorporating my whipped butter into my routine last week I used it again and yes this addition is a winner! I ended the week with hair that wasn’t thirsty, dull or knotty. I will say that I started the week with hair that felt different…stronger, I think my hair was in need of a really strong Protein DC. I will just end this with: I was working with hair that retained moisture, had less tangles and less frizz = happy Mai. So digging this challenge experience and experiment! On the last home stretch! This entry was posted in Castor Oil, Castor Oil Challenge, Cocoa Butter, DIY Creamy Leave-In, DIY Moisturizing Deep Conditioner, DIY Protein Deep Conditioner, DIY Whipped Butter, Hair Challenge, Organic Unrefined Cocoa Butter, Organic Unrefined Mango Butter, Organic Unrefined Shea Butter, Protective Style, Protective Style Challenge, Random Up-Do's, Tuck and Pin Updo, Whipped Butter, Whipped Butter for Hair and tagged castor oil, Castor Oil Challenge, Castor oil for hair growth, castor oil for healthy hair, castor oil for healthy scalp, castor oil for natural hair, DIY Creamy Leave-In Conditioner, DIY Whipped Butter, Napturally Curly, Napturally Curly Forum, Protecting ends with Up-do's, protecting natural hair, Protective Style, Protective Style Challenge, Protective Styles, Protective Up-do's, Shea Butter, tuck and pin, Tuck and pin updo, updos, Whipped Cocoa Shea Mango Butter, Whipped Hair Butter on October 30, 2014 by Maicurls. How did my fourth week go? I did my wash day routine on Sunday, a Henna Gloss followed by a moisturizing Deep Condition, moisturized and sealed before twisting 9 chunky twists. 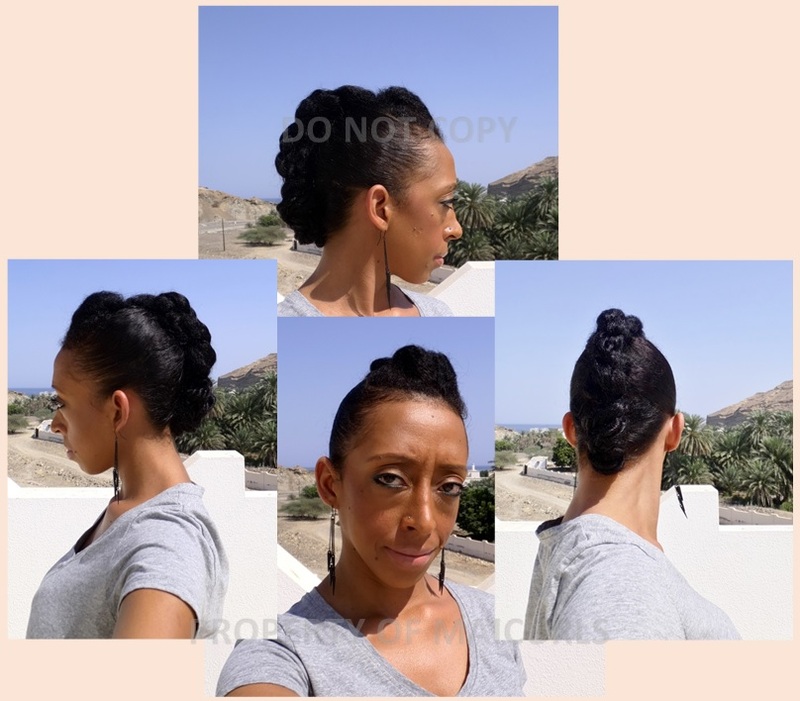 Day 1 – After taking down the twists I massaged my Castor Oil Mix on my scalp, hairline, ends and put my hair in the Gibson Tuck with 2 two-strand twists on the side and a chunky two strand twist at the front – pinned as a “side bang”. 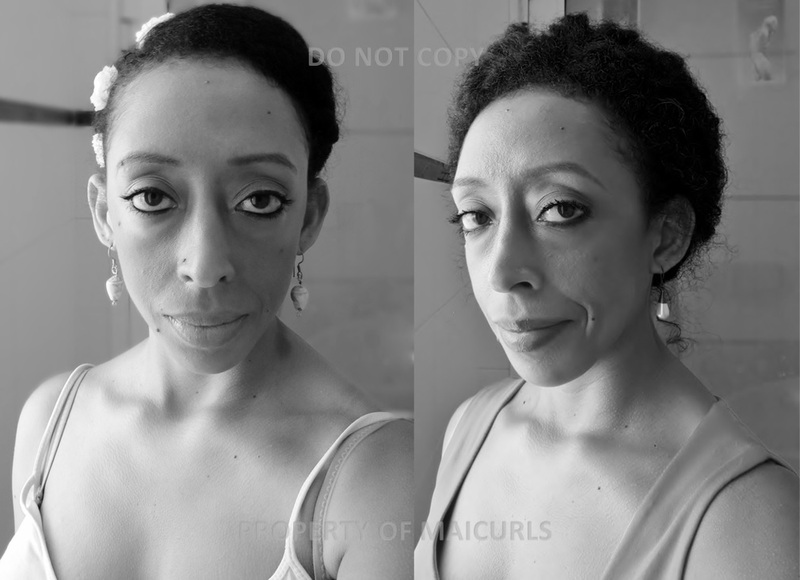 Gibson Tuck with two two strand twists on the side and a chunky two strand twist as a side bang. 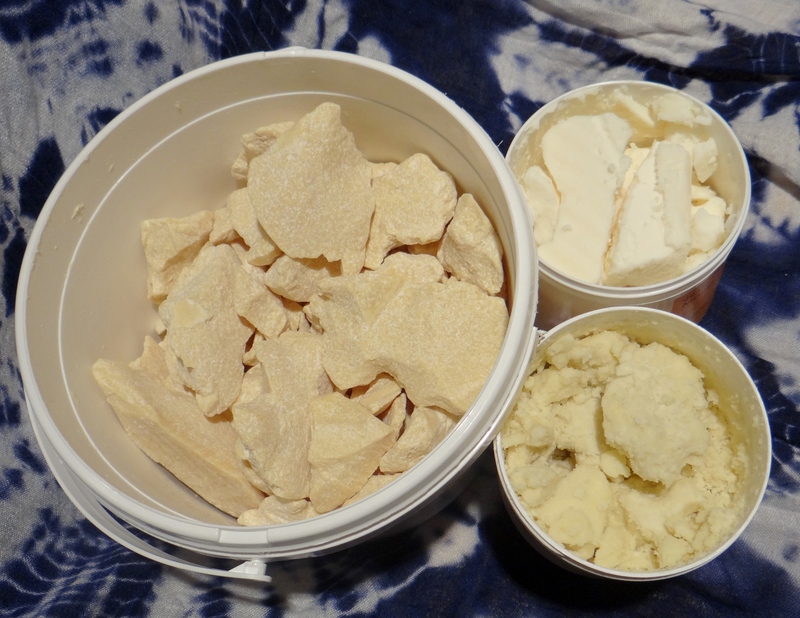 Day 4 – I moisturized my hair with my DIY Creamy Leave-In Conditioner and sealed with my whipped butter mix. I then put my hair into my Chameleon Twist. To do the style I first did my “Twisted twist”. – After making one big two strand twist from 7 medium twists held at then center of my head I tucked away the ends of my hair by wrapping it around the base. Day 5 – I took the Chameleon Twist down and massaged my scalp (as best I could), hairline and the ends of each of the 7 twists with my Castor Oil Mix then wrapped it back up. Day 6 – At night took my hair down, massaged my scalp, hairline and ends with the Castor Oil Mix and pineappled to sleep. Day 7 – Wash day routine and then got my hair ready to be set for week 5. As mentioned, I used the blend 4 times during the week and my hair was suuuuuper smooth, moisturized, shiny and soft! I think my whipped butter sort of helped with that as well (particularly on my ends). 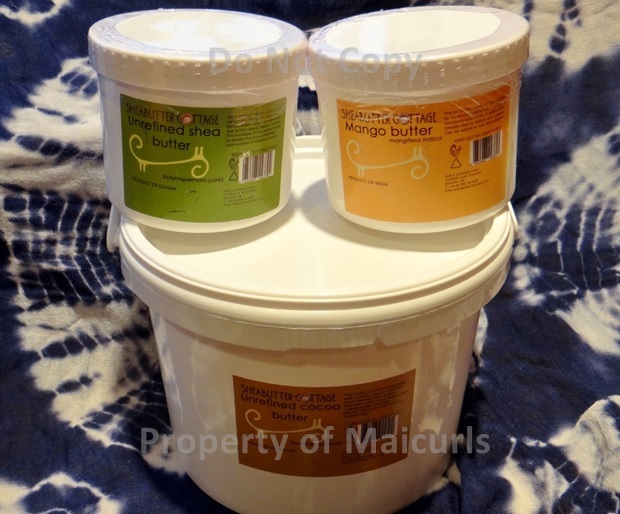 I had been using my DIY Spray Leave-In Conditioner to remoisturize my hair mid week but decided to use the Creamy Leave-in and whipped butter for a change. My hair LOVED the combination of being moisturized and super sealed. I can’t say it enough, castor oil is the truth and when combined with other nourishing ingredients …bye bye dryness! Looking forward to the last 2 weeks. What do you think of the styles I did this week? This entry was posted in Castor Oil, Castor Oil Challenge, Chameleon Twist, Chunky Twist, Cocoa Butter, DIY Creamy Leave-In, DIY Henna Gloss, DIY Leave-In Conditioner, DIY Moisturizing Deep Conditioner, DIY Whipped Butter, Gibson Tuck, Hair Challenge, Henna Gloss, Organic Unrefined Cocoa Butter, Organic Unrefined Mango Butter, Organic Unrefined Shea Butter, Protective Style, Protective Style Challenge, Two Strand Twist, Whipped Butter and tagged castor oil, Castor Oil Challenge, Castor oil for hair growth, castor oil for healthy hair, castor oil for healthy scalp, castor oil for natural hair, chunky two strand twist, DIY Creamy Leave-In Conditioner, DIY Whipped Butter, Gibson tuck, Napturally Curly, Napturally Curly Forum, Protecting ends with Up-do's, protecting natural hair, Protective Style, Protective Style Challenge, Protective Styles, Protective Up-do's, Shea Butter, two strand twists, updos, Whipped Cocoa Shea Mango Butter, Whipped Hair Butter on October 21, 2014 by Maicurls.